Ever wondered how the Internet knows which website to display when you type yourbikeshop.com into a browser or click on a link in a list of search results? DNS is an abbreviation of Domain Name System. When one types a website address (domain) such as yourbikeshop.com into an Internet browser, those letters are converted into a sequence called an Internet Protocol address or IP address for short. DNS is the system that performs the conversion process and it runs according to records stored at a registrar and/or web host. Those records tell the DNS what IP addresses to use for each domain and how to handle variations of the domain that may be entered in an internet browser. A registrar is where your domain is registered. Two popular registrars are GoDaddy and Network Solutions, and there are many others. Your registrar may also be your web host (see below) where your DNS records are kept. If this is the case, DNS record management is performed at your registrar. It is possible to use one provider as a registrar and another as a web host. A web host keeps the DNS records for your domain on what are called nameservers. GoDaddy’s nameservers look like ns55.domaincontrol.com & ns56.domaincontrol.com and Network Solutions’ look like ns55.worldnic.com & ns56.worldnic.com. SmartEtailing’s name servers are ns1.smartetailing.net & ns2.smartetailing.net. DNS records are the rules that make everything work. 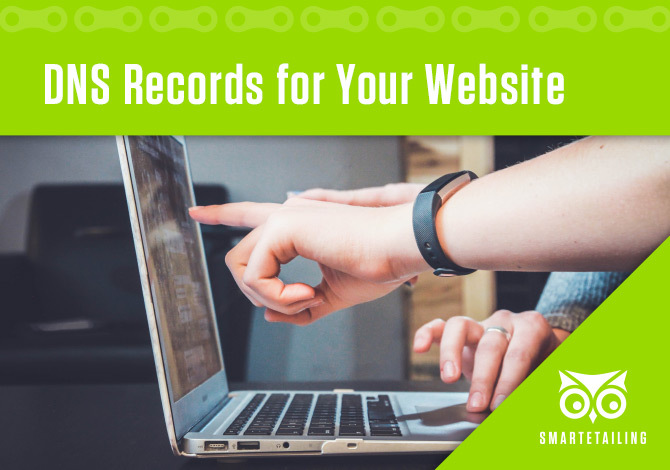 Although there are many types of DNS records, the main ones related to making your website display and your email work are of the A, CNAME, and TXT type. A records define the location of a destination on the Internet, such as your website. It points to an IP address that looks something like 12.34.5.678 or 12.345.678.90. CNAME records, also known as sub-domains, tell the DNS what to do when someone enters a domain with a prefix such as www. For example, www.yourbikeshop.com would point to the yourbikeshop.com. That way, the domain can be entered in a browser with or without www and the visitor still ends up at the same website. MX records, short for Mail eXchange, are used to direct domain email (you@yourbikeshop.com) to and from other email addresses. MX records look like mx1.emailsrvr.com or alt2.aspmx.l.google.com. TXT records associate readable text with the domain. These are frequently used for domain ownership verification and email authentication. An example of a TXT record is v=spf1 include:_spf.google.com ~all. Want to learn more? If you have questions about DNS or would like to know more about how it works, please use the comments below and someone from the SmartEtailing DNS Team will reach out to you.